So, now I know what it feels like in a washing machine...sort of anyway. That is the image that comes to mind when I think of yesterdays swim and like a washing machine, my mind went in soiled and came out clean and fresh. 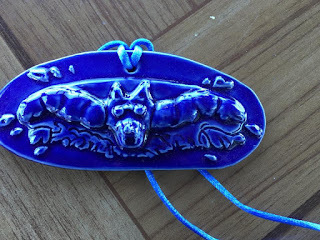 This is my race recap of the King Wolfe Swim. 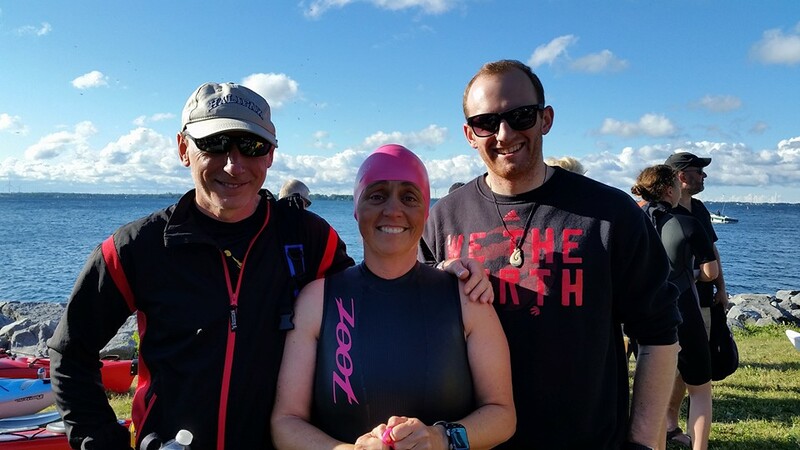 Last year, a my friend Trevor suggested this 5ish k open water swim to me as a nice swim, flat water in the past and great support. I decided to sign up around New Years Eve and made a plan to increase my swim distances in the pool through the winter. 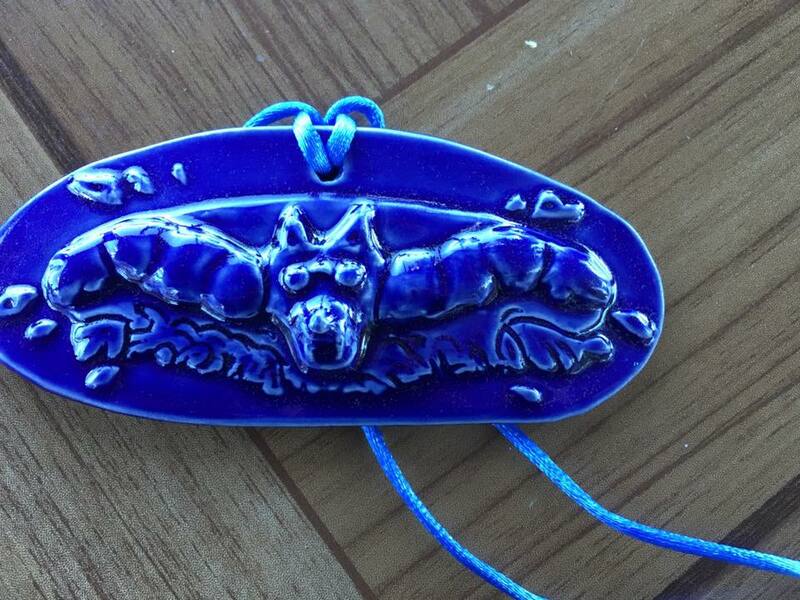 I did manage one long open water swim the week before and swam the whole distance so I knew I was ready. 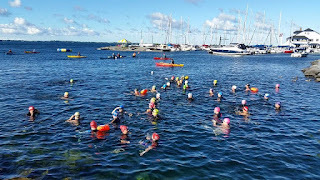 We arrived in Kingston on Canada Day and I headed for kit pickup on the shore of Lake Ontario. I was not planning on going to a practice swim but Deborah recommended it. The Lake looked rough and the forecast for Saturday was the same so I thought I should get some practice in. I had never swam in anything so rough and choppy and I was getting worried. 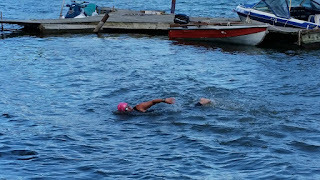 I tried to do the 500m swim but I drank the lake several times and really started to panic. Saturday morning was nice and sunny and windy and the waves still looked rough, I was not sure I could do this or that I wanted to do this. I was trying to stay calm but the pre-race briefing did not help much. Anita and Andre showed up to cheer me on with Neale and Stephen; Anita knew how panicked I was but told me I could do it and I knew I needed to start. I had all these negative thoughts in my head, I could not do it, I was not a good enough swimmer, what if I had to stop midway through...the same old tape that plays in my head every time. I decided I had to start, I would do 1k and then decide, 1 k at a time if I needed to but I was not going to quit without trying. I knew 11 people, including two that morning pulled out of the swim but like last year at the Ironman, I knew that giving up/not starting would hurt more than trying, giving my all and failing. I started swimming and I felt like a cork bobbing in the water, wave after wave made it feel like I was not making any progress. 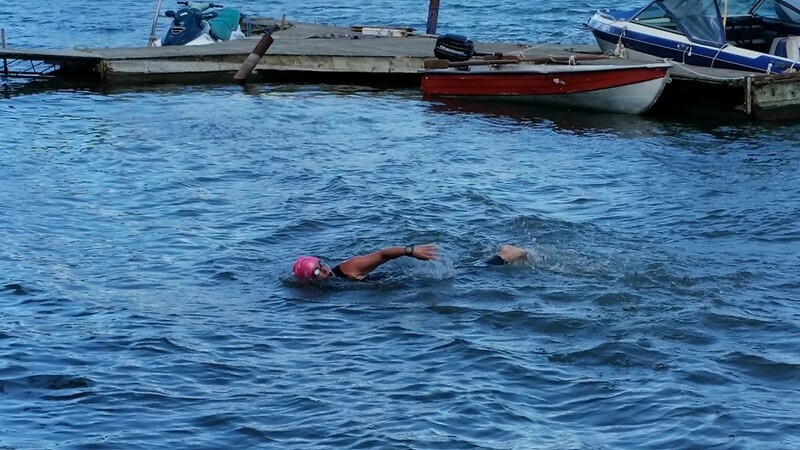 My Garmin said I was at 1km and I still felt good, I had not swallowed much of the lake so I decided to carry on. At 1500m I had had enough, I was not having fun and not sure I was getting anywhere. I called out to my kayaker that this was not fun and treaded water for a few seconds. I looked back towards Kingston and then ahead at Garden Island and realized I was about half way between and I had to make a decision. Could I do this for another 3.5k or should I stop. 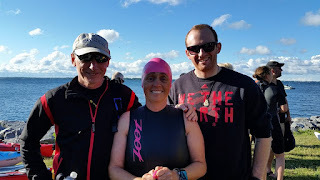 I thought about last summer and the Ironman, I thought about everyone who said I could do it and I thought of Neale`s never-ending support and decided to keep on going, I was not going to stop swimming until I was pulled from the water or I got to Wolfe Island, I was going to finish this. 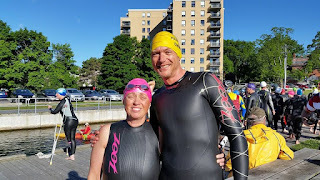 I started thinking of all the advice I gave others, I counted my strokes, everytime I got to 10 strokes, I did a breast stroke and sighted and then I repeated the mantra that came to me as I swam, too tough to kill, to determined to quit. Eventually we got close to Garden Island and I heard cheering, I stopped and went over to my Kayaker and took in a gel. I looked around and noticed there were people on the point cheering us on and that made me feel great. Around the island I could see the bottom and that is comforting to me, I looked around and saw wood and weeds, zebra muscles and rocks and I could see I was going forward. The waves slacked off a bit in the shelter of the island and I started having fun. Mike, my kayaker said I made great progress in this section, a straight line and I even passed another swimmer. Once we hist the small rocks known as Goose Island I could touch the bottom so I stopped for a minute, talked to Mike about direction and remembered Deborah saying at this point we were 90% done. All I wanted was to get this swim over with so I quickly started swimming again. This section was really choppy, the wind was up and we were no longer sheltered by Garden Island. I remembered Deborah saying stay right to avoid the ferry and all I could think about was where is that darn ferry, I had come to far to end my day as the hood ornament for a ferry. A few quick corrections and Mike lead me into the beach, I was done and never so happy to be on dry land again. 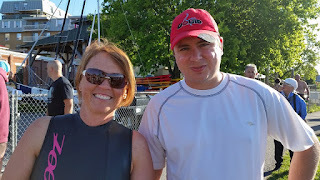 I was surprised to learn my time, despite the wind and the choppy waters I had a good time, my goal was 2:15 and I was at 2:22 with my stops, not bad all things considered. The best part was when I saw Trevor I asked if we were going to swim back now, I really felt like I could keep swimming and go back BUT taking the ferry back was nice as well. I entered Lake Ontario full of doubt and exited full of joy and hope, the waves that bounced me around cleansed my soul and chased away my negative thoughts. I always think I am not good enough, that I can`t do the task ahead of me but time and time again my body and heart have a different plan and it is that one I want to keep following. Thank you for sharing this story. I am a novice triathlete and open water presents me with many of the self doubts you describe. Love how you faced down your desire to stop and kept on going. 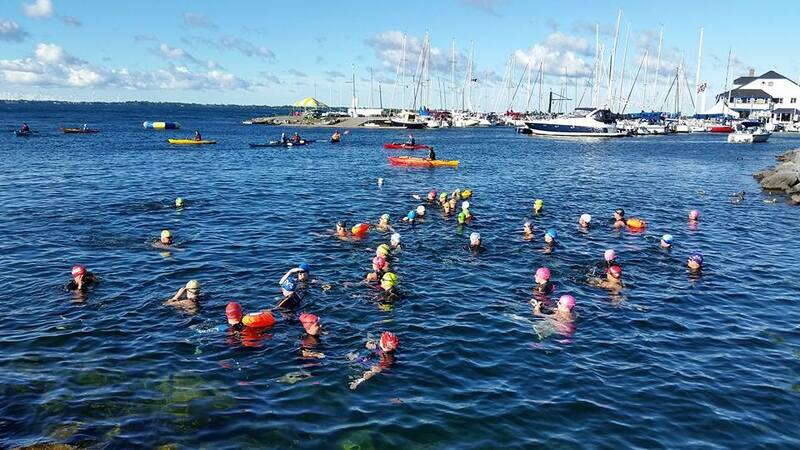 I will remember your experience when I'm out in the water (frequently lake ontario for me as well, just down at the western end) questioning why I even started in the first place. Thank you for your comment. You are the reason I write my blog, if I helped you even a little bit it makes it all worth while. Best of luck in your triathlon journey, it's a wild ride and so much fun.